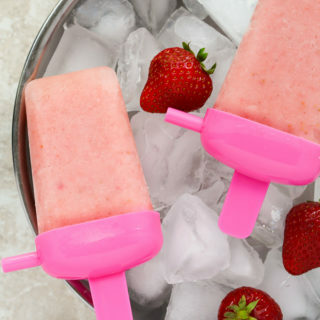 4-ingredient, Healthy Strawberry Popsicles! These delightful frozen treats are naturally sweetened and a cinch to make. There is seriously nothing better than an ice-cold popsicle on a hot summer day. I used to always keep my freezer loaded with store-bought popsicles during the summertime, but those usually contain a lot of sugar and additives. So I developed a healthy, refined sugar-free recipe for popsicles featuring one of my favorite fruits – strawberries! TIP: If you use plastic popsicle molds (which I do), be sure to hold the popsicle molds under warm running water for about 30 seconds before removing the popsicles. This loosens the frozen popsicles, so that they release easily when pulled out of the molds. Plastic Popsicle Molds – These are similar to the ones I used in the pictures for this recipe post. They are inexpensive, sturdy and have a built-in drip guard to keep your hands and clothes clean! Add all ingredients to a blender. Blend until smooth. Pour into 8 popsicle molds. Freeze for at least 4 hours until completely frozen. To make this recipe vegan: Substitute the low-fat milk with any non-dairy milk (such as almond, coconut or cashew milk) and substitute the honey with maple syrup. Thanks Robyn! ♡ I love homemade popsicles too! These look so delicious, and I totally love that they are so easy! Thanks for the recipe – Pinning!